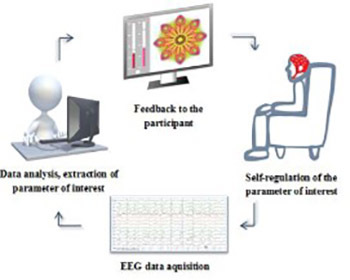 Electroencephalographic neurofeedback (EEG-NFB) represents a broadly used method that involves a real-time EEG signal measurement, immediate data processing with the extraction of the parameter(s) of interest, and feedback to the individual in a real-time. Using such a feedback loop, the individual may gain better control over the neurophysiological parameters, by inducing changes in brain functioning and, consequently, behavior. It is used as a complementary treatment for a variety of neuropsychological disorders and improvement of cognitive capabilities, creativity or relaxation in healthy subjects. In this review, various types of EEG-NFB training are described, including training of slow cortical potentials (SCPs) and frequency and coherence training, with their main results and potential limitations. Furthermore, some general concerns about EEG-NFB methodology are presented, which still need to be addressed by the NFB community. Due to the heterogeneity of research designs in EEG-NFB protocols, clear conclusions on the effectiveness of this method are difficult to draw. Despite that, there seems to be a well-defined path for the EEG-NFB research in the future, opening up possibilities for improvement.